Catalogue and images of over 1,800 FSAT artist's and trial color proofs. Catalogue and images of over 900 SPM artist's and trial color proofs. Images of over 900 artist's proofs from Andorra, New Caledonia, French Polynesia and Wallis & Futuna. Galleries with more than 500 artist's proofs of the topics art, Europa, ships and trains. More. Images of some of my favorite proofs, including trial color sheets and color galleries of up to 32 different colors of a single stamp. More. Feel free to contact me if you want to sell or trade proofs, or if you would like advice on French-area proofs. More. June 2017: 400 new photos of FSAT artist's proof and 90 new photos of Andorra artist's proofs, plus more than 50 new photos of French art, French Europa, and New Caledonia artist's proofs. More. 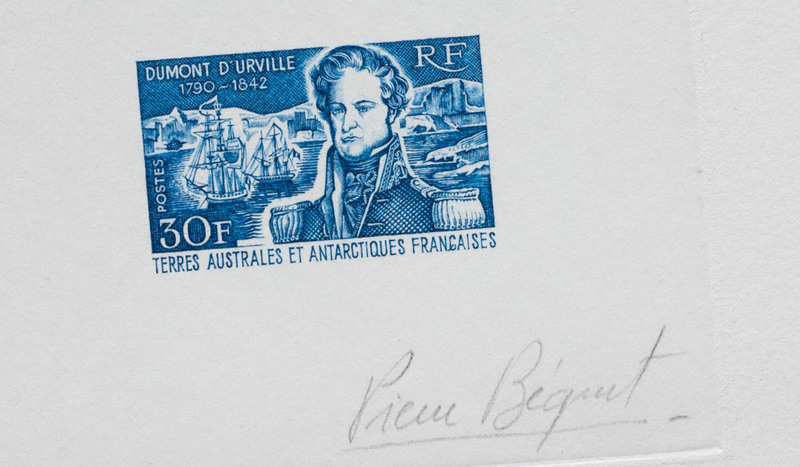 Welcome to Stamp Proofs, the online gallery and catalogue of artist's proofs of the stamps of the French Southern and Antarctic Territories (FSAT), St. Pierre & Miquelon, Andorra, New Caledonia, French Polynesia, and Wallis & Futuna, as well as French art, French Europa, trains, ships and other topicals. There are also galleries and catalogues of trial color proofs of FSAT and St. Pierre & Miquelon. The goal of the website is to show the exceptional beauty of French-area proofs and to provide a reference for collectors. The focus is the different colors used for proofs of each stamp. There is also detailed information about how artist's proofs and trial color proofs are produced, including information about colors, paper, watermarks, engravers' signatures, and quantities printed. The galleries have high-resolution images of more than 3,500 proofs on over 400 pages. There are also four catalogues: FSAT artist's proofs and trial color proofs, and St. Pierre & Miquelon artist's proofs and trial color proofs. Artist's proofs are part of a rich French artistic tradition. They are intended to showcase engraved stamps as examples of the art of fine engraving. For each engraved stamp issued since 1960, an artist's proof was printed by the postal authority from a master die on high-quality art paper in quantities of 8-28. (Earlier proofs were printed by the engraver and the quantities issued is believed to be higher.) Each proof is usually printed in a single color, with 3-6 different colors chosen for the artist's proofs of each stamp. After printing, the proof is embossed with the official seals of the French government printer and signed by the engraver. The galleries show close-up images of the center (stamp) portion of the artist's proofs. This permits showing larger images and fitting different color proofs side-by-side on the same page for easy comparison of colors. Images of some entire artist's proofs are shown in the highlights section. Trial color proofs show the effect of different combinations of ink colors on the appearance of a stamp, thus providing insight into the role of color in stamp design and the printing process. They are of particular interest to collectors of a particular topic or stamp because they allow collecting a wider range of different colors than is possible with only the issued stamp. Most trial color proofs were produced from the 1950s to 1984 in quantities of 300-750 (30 sheets of 10 or 25). Sheets normally contain proofs in eight different colors, three mono-colored and five multi-colored. The trial color proof galleries show high-resolution images of more than 1,600 trial color proofs. The catalogs provide details on ink colors used for trial color proofs of FSAT and St. Pierre & Miquelon. The Highlights section shows images of some of my favorite artist's proofs and trial color proofs that are not included in the other galleries, as well as entire sheets of trial color proofs. Feel free to e-mail me if you you have any questions on French-area proofs or have images or information to add to the site. My goal is to eventually include images of most FSAT and St. Pierre proofs, as well as many topical proofs, on the site.